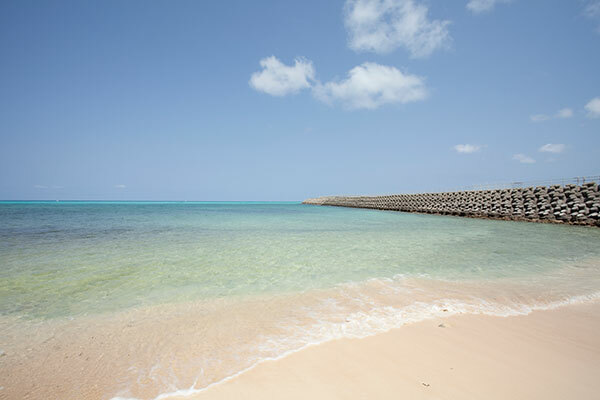 Among Okinawa's 49 inhabited islands, each with its own characteristics, the Miyako Islands are particularly known for their unique culture and atmosphere. On the same latitude (24°) as Hawaii and the Caribbean, the island folk are friendly and easygoing. Dotted with many ancient spiritual sites, these islands have a mysterious air about them. 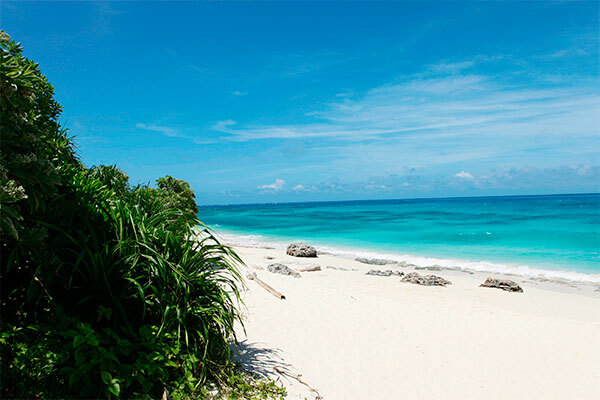 The iconic beach of Miyako Island, Yonaha Maehama Beach was the first place winner in the 2013 Travelers’ Choice Awards for the top 10 beaches in Japan by TripAdvisor. In short, Miyako is a beautiful island with alluring powder-sand beaches, including Yonaha Maehama Beach, reputed to be one of the best beaches in Asia. With approximately 15 flights leaving daily from Naha Airport and with less than an hour of flying time, Miyako is now closer than ever. Extensive sugar cane fields, enchanting crystal clear waters and white sand beaches… these breathtakingly beautiful scenes await you at every turn. 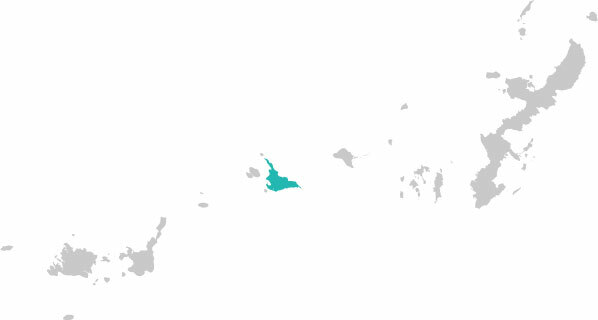 Various smaller islands also appear in the Miyako jurisdiction; to the northwest you can see Ikema, the tiny Ogami to the north, Irabu and Shimoji to the west and the small Kurima to the southwest. 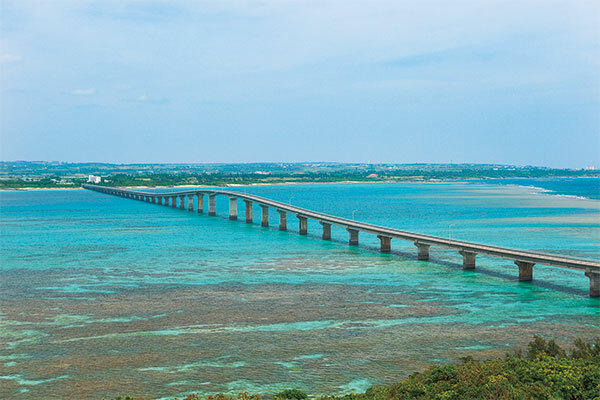 Actually, Ikema and Kurima are each connected to the main island of Miyako by two one-and-a-half-kilometer bridges, Ikema Ohashi and Kurima Ohashi, respectively. Popular tourist spots, these little satellite islands are blessed with transparent waters and white beaches. 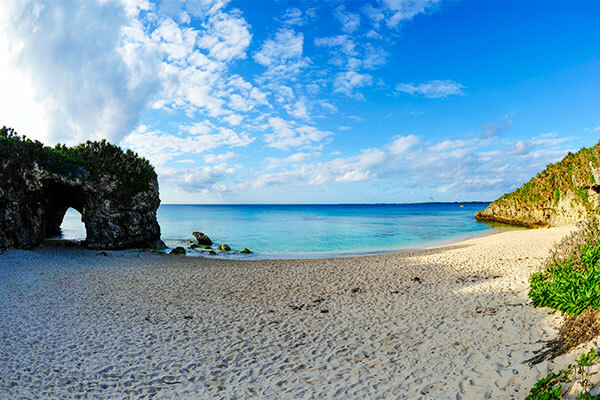 The enchanting Sunayama Beach with its naturally occurring arch is known for being a fantastic place to watch the sun go down and is popular with locals and tourists alike. The north side of the island is home to Yabiji, the largest grouping of coral reefs in Japan. These 100 or so coral reefs are famous for being visible above the water line during the lowest tide of the year. 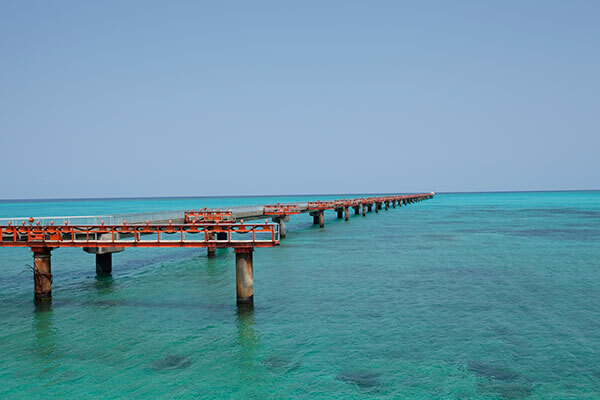 Yabiji is one of many colorful diving and snorkeling spots only a 30-minute boat ride from the Ikema shore that attract some 30,000 divers to Ikema each year. Tori-ike (literally “Path Lake”) is an unusual location where fresh and sea water mingle and make for an awesome diving spot. Miyako Island is rapidly growing in popularity nationwide. In 2005, Miyako’s appeal was heightened with the addition of luxury hotel Shigira Bayside Suite Allamanda on the premises of the Shigira Resort, which stretches along the south coast of Miyako Island and is filled with hot springs and delightful restaurants featuring colorful southern island themes. Shigira Bayside Suite Allamanda provides a sophisticated upscale experience for holidaymakers. 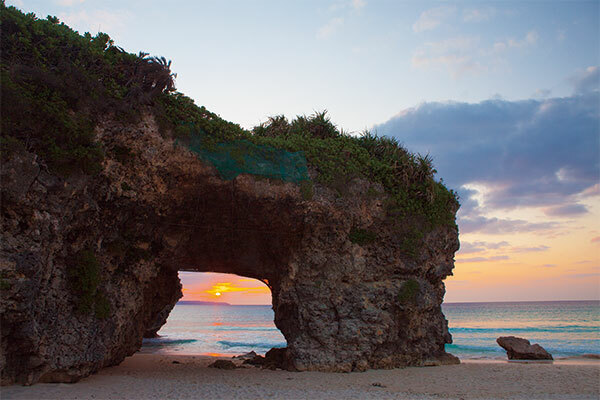 The enchanting Sunayama Beach with its naturally occurring arch is known for being a fantastic place to watch the sun go down and is popular with locals and tourists alike. It is said that there are around 900 sacred sites (utaki) dotted throughout the Miyako archipelago. On Ogami Island in particular most areas outside the small village community (population of 50) are deemed sacred and off limits. There is a legend that long ago pirates buried treasure on the sea floor near Ogami. At one time there was even a gold rush on the island. Recent visitors, however, are more of the touristic persuasion, seeking to experience the power of this ethereal place. In the interests of preserving the environment, note that it is prohibited to enter the sacred areas and that shells, leaves and so on must not be removed from the island. Irabu Island, located about five kilometers northwest of Miyako Island, is a very popular destination among divers, with a number of dive spots that contain unique underwater geographic formations. Irabu Island is connected to the adjacent Shimoji Island by six bridges. In addition, the construction of a bridge that connects Irabu and Miyako is currently under way with completion expected in 2015. 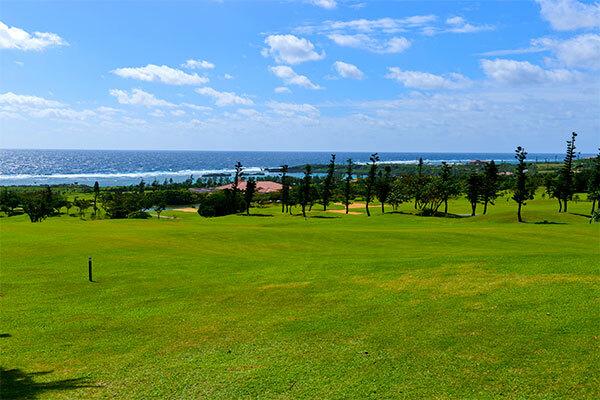 The main highlights of Irabu Island include the beautiful Sawada no Hama beach on its northwest coast, Toguchi no Hama beach in the south, a sheer coastal cliff in the eastern part of the island and more. 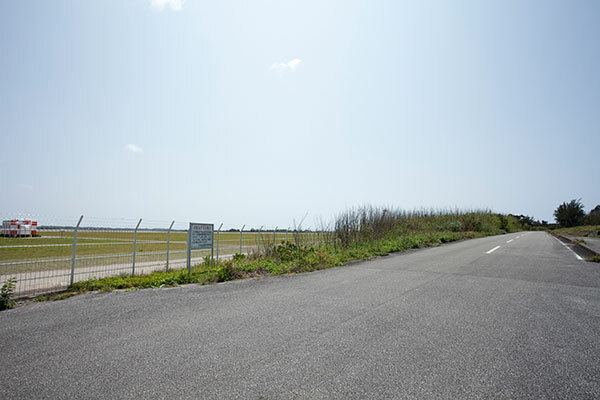 A large portion of Shimoji Island's land is occupied by Shimojijima Airport, which is a flight training ground for Japanese airline pilots. Tori-ike, located near the west coast, is one of the key attractions of Shimoji Island. Tori-ike is a pair of ponds that are joined underground, with one of them connected to the ocean by an underground channel. 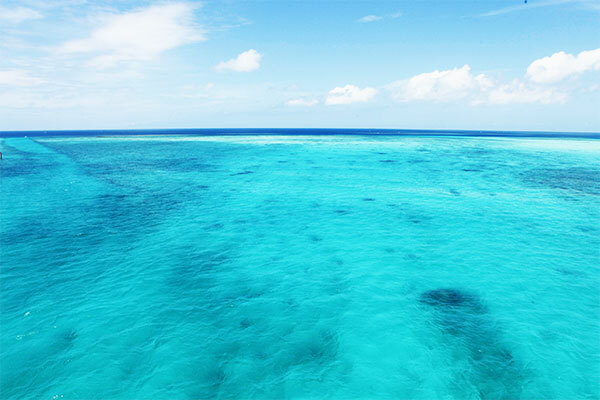 The ocean part of this channel is one of the most popular dive sites in the Miyako area. Also equipped with trails, Tori-ike is also a great place to enjoy a leisurely stroll in the island's nature-rich setting. There is only one car rental company located on Irabu Island, with no means of transportation available on Shimoji Island. In order to best enjoy exploring these islands, renting a car on Miyako Island and taking it with you aboard the ferry to Irabu Island is recommended. *Vehicle ferry services between Miyako and Irabu islands are also available from various ferry operators (12-14 trips a day; fare for regular-size vehicles including the fare for one person 3,000-3,600 yen).